Happy Sunday! The sun is out and it's beautiful, fall is coming day! We've had days of rain, again so today is a blessing! I was at Country Quiltworks to meet some of my customers. It's nice to run into shop customers that I used to help when I worked there. Today there were 2 regulars and I said hello and remembered their names which was quite a surprise to the one lady! I made her smile. 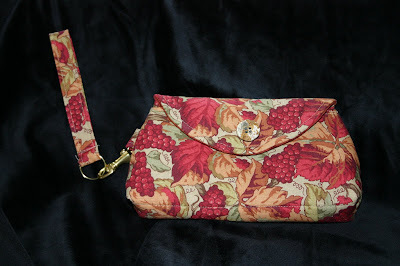 I dropped off my sample for the wristlet handbag class that I will teach next month. It was fun and easy to make. I met the designers in Pittsburgh at Spring Quilt Market this past May. Nice ladies with some really neat patterns, Purse-O-Nalaties of Palm Harbor is their name if you want to see their other patterns! I think that this little bag would make a great gift for a young woman, a teacher or babysitter!